Awesome seeing another Nintendo fan boy on this site. We are few but we are powerful!!! haha my arse you are!!!!! my ps2 fanboys own you all! I’m somewhat a nintendo fanboy. I own the PS2, XBOX, and GAMECUBE, but I’ve grown more fond of the gamecube. Cuz I love the games on there. Especially Four Swords Adventures, with me hooking up my sp, and having one of my friends hook up their SPs. Nintendo served me well with the NES, and SNES. (Didnt buy an N64, I hated those things) and its serving me well with my Gamecube and SP. We should bring this thread back! 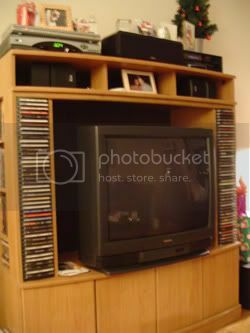 I was thinking about getting a DLP or a LCD TV, about 42” or 50” or so, for the room. Either that, or I want to get a projector. We have a nice wall in the apartment that would be perfect for a projector. I need to get the money saved up, and then maybe I’ll buy it by the end of the summer. I think that would be very awesome. It’s funny how everyone’s theatre is in the basement. Cuts down on all those: “Turn that F***ing S*** down!” yells from your parents. I’ll post pics later tonight.